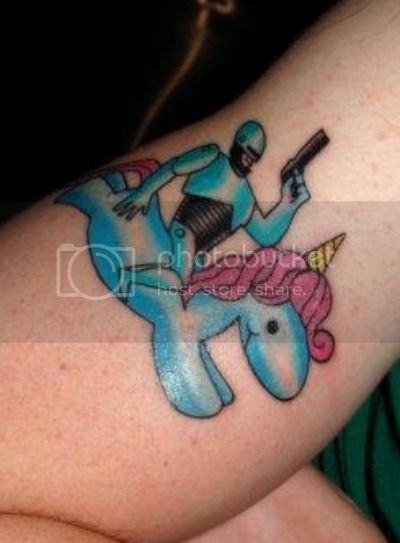 So… that’s a tattoo of Robocop on a unicorn. In case you’re not familiar: the Robocop/Unicorn “ticket” was a popular meme during the presidential campaign of 2008, featuring artwork and spoof videos. It kind of fell off the map after the election. Clearly someone didn’t get the memo. Via Ugliest Tattoos, whose bread and butter is tattoos of something riding something else. If you know what I’m sayin’. Next post: Geek Steal: Save 59% on Any Doctor Who Season on DVD! Previous post: Geek Steal: 60% or More off Sci-Fi DVDs and Blu-rays!